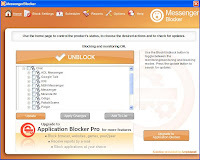 Messenger Blocker allows parents to control their childs online activity on IM clients. 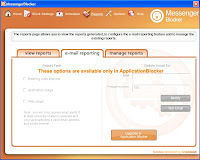 With Messenger Blocker you can block all chat clients and get usage reports. It's compatible with AIM, Gtalk, MSN, WLM, Yahoo, Miranda IM, Pidgin etc. # Block chat. Beside the fact that it is a yahoo free blocker and msn messenger blocker, the parental control software will stop all chat applications launched, before they take place. You don’t have to worry anymore that your child might talk with strangers while you are away. # Choose user to block. If there is more then one account on the computer you can choose a specific user whose chat conversations to be blocked. # View and manage reports. By accessing the user interface, you will be able to view reports related to the web usage, application usage and with the breaking rules attempts. You can further choose to delete the logs manually or to set the automatically deleting. # Notify user when blocked with customized warning message. The free blocker allows you to notify users when are blocked and more than that, you can write customized messages. # Updates. Periodically, you can hit the Updates button, and if there is a new version of Messenger Blocker available on the market, it will be instantly installed.